As luck would have it, both Mendez and Melo have graduated to the Power 50, at #36 and #46, respectively. Mendez has played the whole season for Ogden and has kept his batting average above .300 for most of the season. He has also showed a knack for stealing bases, and broke the Pioneer League record for stolen bases in a game, with 6. Melo started the season out in Arizona, but after a very hot month, was promoted to Ogden, where he is presently. Melo too has continued to show that he is one of, if not the, fastest and best baserunners in the organization. Gomez and Perez are also both in Ogden. Gomez started off the short season playing second base for Arizona, but after batting almost .400 during the month of July, was promoted to Ogden recently. Perez has pitched the whole year in Ogden, and after a sluggish start, was the Raptors' best reliever during July. Martinez, Ramirez and Correa are all in Arizona. Martinez, still just 17, has struggled finding the strike zone in Maryvale. Ramirez, who like Perez started off slowly, was red-hot during July (a 2.78 ERA in 35 innings), and is also still just 17. Correa has struggled with the strike zone on and off all season, though his ERA has been on a gradual decline. Ventura, Heredia and Laureano are all in the Dominican Summer League, and helping that team to a 42-16 record so far. Ventura has remained a staple in the DSL Brewers' rotation, though his chances of pitching stateside are diminishing. Heredia has become a fixture at the end of games for the DSL team - he has 4 saves and a 1.16 ERA in 23 innings. Laureano has been solid, if not dominating, in the DSL rotation and bullpen. After a poor start to the season, where he allowed 9 earned runs in his first 2 starts, Carlos has settled into a very good groove down in Arizona, and his 2.78 ERA during the month of July put him squarely in contention for Pitcher Of The Month honors. While not overly tall, Ramirez has a good pitcher's frame, especially as he adds some more weight. The two biggest things going for him are, he doesn't turn 18 for another week, and he is lefthanded. He is a very good physical presence on the mound, and has good enough tools to move to the infield if he fails on the mound. He doesn't strike out a whole lot of guys, but he pitches to contact very well, and once he develops all his pitches, Carlos has the chance to be a very good middle of the rotation starter. He is probably slotted for Ogden next season. It would help his development if the Brewers kept him in the rotation, though the Brewers tend to work their younger Dominican players out of the pen as they move up through the system. After a season in the shadows behind Manuel Melo and Mario Mendez in the 2001 DSL campaign, Fausto has really come into his own this season, and may turn out to be a bigger prospect than either of those two. Mejia already has legit gap power and good speed on the bases. His 22 doubles and 5 home runs both lead the DSL Brewers, and his 11 stolen bases are third on the team. While his stature is not imposing at the plate, he appears to get maximum effort from it. He makes good, solid contact at the plate, though it would behoove him to draw a few more walks. If he has the ability to play center field, he is much more valuable than if he only plays in the corners. He turns 19 this winter, so if he plays next season in the states, he'll be one year ahead of both Mendez and Melo development-wise. He's a tad bit older than you'd like for a Dominican prospect in Arizona, but Luis has shown flashes of dominance down in Maryvale. He has been unhittable at times this season, and has also shown the ability to strike out batters in bunches. Luis' biggest problem right now seems to be consistency, but with his frame, some mechanical problems are to be expected early on. Luis needs to add some more weight to his frame to help get some muscle behind his fastball. He has the tendency to walk some batters, so it appears that his offspeed stuff needs some work, and if that is the case, he might become a bullpen prospect down the road, and he has the frame to be a potentially good closer. He turns 20 in the offseason, so he'll hopefully be in Ogden next season. An ex-catcher, Perez has brilliant as the DSL Brewers' closer last season, and the Brewers thought enough of him to promote him right past Arizona to Ogden. While he struggled with his control early, he adjusted nicely to the Pioneer League and was one of the 2 or 3 best pitchers on the whole Ogden staff during the month of July. If his DSL numbers are any indication, Perez has the ability to get batters to swing and miss regularly, and as he has shown in Ogden recently, can bear down and get outs when he needs them. He has shown a very good closer's mentality after what was likely some nervousness early on in the season. Since he will stick in the pen, he really doesn't have to concentrate too much on anything more than a fastball and a changeup, so that should help him develop a little more quickly, which he'll need to do, already being 21. Segura has come out of nowhere to be one of the leaders on the DSL Brewers team that is making another championship run. Alberto split catching duties last season with Jose Leon and showed little offensive promise other than an ability to draw some walks. He only hit .214, and he hit with little power. This season has been a whole other story. Segura is second on the team with a .309 batting average, has a 22:15 BB:K ratio and has a .504 slugging percentage, as a result of 22 extra base hits, a good number for the DSL. He has a good, stout catcher's frame, and if he continues to develop his batting skills, his power is projectable. The only part of his game that hasn't improved this season in his speed, but being a catcher, that doesn't really matter. He has certainly earned a ticket to Arizona next spring, and doesn't turn 19 until the offseason, so he could be the most overall-promising catcher to come out of the DSL for the Brewers. Martinez has one of the biggest pitching frames in the system, especially after considering the fact he just turned 17 about a week ago. He's not an overly slight 6'7, either. With the correct instruction and mechanical adjustments, it's not had to see Alvaro throwing in the low to mid 90's, with ease. His downward plane towards the plate should create some angles batters just don't see that often. All of this is just projection for the moment, and Alvaro still needs a bit of work. Martinez has been all over with his pitches, walking 18 guys and allowing 21 hits in 18 innings of work thus far in Arizona. He has struck out 16, but that is about the only promising thing to look at so far on his stat line. Alvaro defines the word "project" and the Brewers have to see this too, because instead of shipping him off to the DSL for a season, they wanted to work with him personally in Arizona, and that is likely to continue next season. Martinez could be a monster some day for the Brewers, but it is going to take a lot of work. 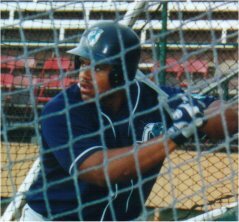 Another pitcher with a gigantic frame for his age, Heredia was moved down to the DSL after spending the spring in Arizona. He has flourished in the bullpen there, with a 1.16 ERA in 23+ innings pitched. While the Brewers like Martinez as a starter, it's not hard to see why they like Heredia out of the pen. He is about a year and a half older than Martinez, and a level below him, but appears to have the mentality to work at the end of games. Since he is older, he won't have as much time to work on offspeed stuff, but as was mentioned with Melvin Perez, that really doesn't matter too much. If his arm strength fills out, a mid 90's fastball and a workable changeup coming from a 6'6 frame will be all he needs to face 3 batters an appearance. It's good that Gomez got to Ogden so quickly, after spending the first part of the short season in Arizona. He turns 21 in the offseason, so he'll have to be brought along fairly quickly. While Gomez has only middling plate discipline and little power, he does two things that make him worthwhile as a prospect: he plays any position besides catcher and he puts the bat on the ball well. He also has decent speed. If they Brewers do decide they like him as an everyday player, he will most likely stick at second base, because he doesn't have enough power to play third. It is also conceivable he could end up in center field, or at shortstop. He has hit well the past 2.5 years, and he needs to keep doing that to move up the chain. After a pretty undistinguished 2 year run in the DSL, the Brewers thought it was time to try out Acosta in Arizona, and he has been a very pleasant surprise for them there. Though a tad bit old, Acosta has shown the ability to get on base, whether it's by hitting for good average, or drawing walks, both of which he has done this season. What Acosta still has working against him that carried over from the DSL is a lack of power, and a lack of speed on the basepaths. While speed is not necessary for the SS position, you'd like a guy to posses some if he doesn't hit for power there. As a result, Acosta will likely move to second base, given the Brewers' steady stream of shortstops ahead of him. Franco was a middle infielder in his first year on the DSL club last season, but was switched to the outfield, presumably center, for this season. Franco has a very good middle infield/center field frame, though it could stand to add some muscle. Franco is a projectable leadoff hitter with good speed. He needs to work on drawing more walks and making a little better contact, but it's likely that the Brewers will move him up to Arizona next season, and should work with him on that. He turns 19 this winter. Combined with Mejia and Segura, that Brewers should have three very interesting offensive prospects in Maryvale next spring. Prince Fielder becomes the third Brewers farmhand to win the Offensive Player Of The Week award twice so far this season, and he is the first non-High Desert player to do so. The young Fielder has made quite an impression on the Brewers so far in his pro career, and this last week of his was in fact probably the best week by anyone in the system this year. Though teams were consistently trying to pitch around him, Prince hit .591/.710/1.000, in 22 at-bats. He hit three doubles, two home runs, drove in seven runs, scored 8 times and walked 9 times, while striking out only twice. For most of the 2002 season, Aaron Sams was a baseball nomad. Not that he roamed from team to team so much, but that his team in the independent Atlantic League didn't have a home stadium, and had to play all their games on the road. After spending about 60 games on the road with the aptly named Pennsylvania Road Warriors (the Minor League Report wonders, if they don't have a home, how can they be from Pennsylvania? ), and making 13 starts with the team, destiny caught up with Sams and the Brewers purchased his contract from the Road Warriors, and assigned him to High Desert. Sams is not new to organized baseball, as he was drafted in the 5th round by the Cubs only 4 years ago in the June draft out of James Madison University. After a few fruitless years in their system, the Cubs released Sams, but he persevered, and is back on the road to the majors. And, oh yeah, he's the Pitcher Of The Week. The 26 year old lefty was marvelous for the Mavericks last week in his two starts. He pitched 11 innings and allowed no earned runs to cross the plate, on 11 hits and 2 walks. He struck out 12 and got the win in one of his starts. Sams is 6'1 and weighs 205 pounds.